Practice 1 - organise area 40x40yds divided into four 20x20yds pitches &apos;place four plrs in each pitch &apos;number plrs from 1-4 playing in numbered sequence in each pitch - instruct plrs firstly to communicate with each other, promote movement to accept the pass and also movement after completing pass . . . PROGRESSION - when coach is confident the correct technical aspects of passing/recieving and creating space is acceptable you can progress practice further by instructing plrs to dismiss with passing in numbered sequence now emphasis is on &apos;keeping the ball&apos;, the coach now instructs plrs to remember their numbers and on hearing their number called each plr in their pitch of that number enters another pitch in a clockwise rotation and automatically become the &apos;pressing plr&apos; . . GOALS TARGETS FOR PLRS - first &apos;pressing plr&apos; to gain possesion or pressure mistake from team in possesion . . 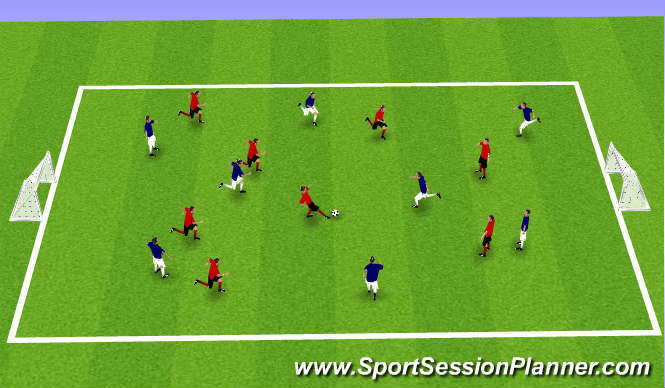 Progression - remove one line to create two pitches instead of four now you will have a 4v4 practice in each pitch &apos;again all emphasis is on how quickly can the team without the ball gain possesion . . CONDITIONED SSG - remove central line and introduce mini goals/targets you now have a small sided game with a 8v8 set-up . .
no sliding tackles . .